Darren Till says he's not closed the door on staying at welterweight and that his move up to middleweight isn't set in stone. 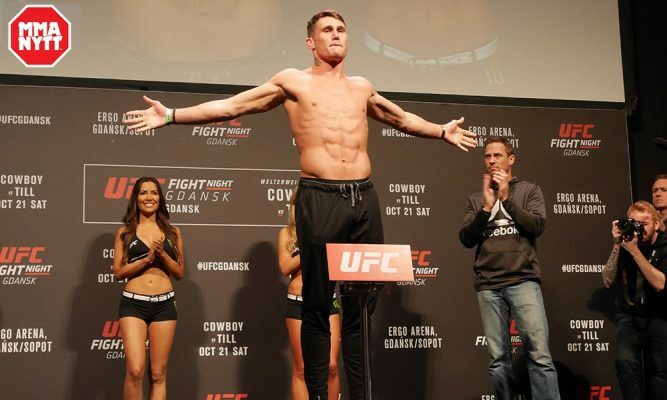 Contrary to reports, Darren Till hasn’t yet made up his mind whether he continues fighting at welterweight or whether he moves up to 185-pounds. The Liverpudlian was last in action back at UFC 228 when he challenged Tyron Woodley for the UFC welterweight title. Till suffered the first loss of his career that evening after being submitted in the second round, but he fronted up to the media afterwards and admitted it just wasn’t his night. Speaking to Ariel Helwani last evening in his first major interview since UFC 228 fight week, Till admitted that the defeat hit him hard. “It’s only just been a year since I beat Cerrone and that year has been a very big year,” Till continued. “There’s been a lot of people depending on me and people are so confident that you’re going to be the champion and then you get that chance and you fight for the belt, and, it’s not that I lost, but it’s the way that I got beat. I didn’t feel like I was able to showcase myself. Just a few weeks ago, Till spoke to his sponsor Paddy Power and said that he would be moving up to middleweight. Having had more time to reflect on the decision, Till says the move up to 185-pounds isn’t set in stone and that he might choose to stay at welterweight should his coach Colin Heron want him to. “I know I haven’t been on much media, but I’ve spoken to my sponsor Paddy Power and I said I might consider it,” Till said. “I’ve not made a final decision yet. I just don’t ever want to be training again and worrying about how much I’m weighing or how much I weigh before a fight. “I’m going to train as hard as I train, but I want to be 100% focused on the fight itself and who I’m going to destroy. I don’t want to be thinking about that I’ve ate a little bit extra then I should have or if it means I’ve got to run an extra 20-minutes.